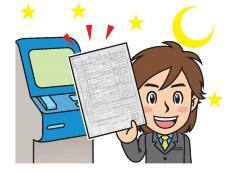 For system maintenance, we stop convenience store grant service of certificate in the next schedule. Grant of certificates such as resident certificate, please use ward office or service counter in the city hall. Using my number card, it is service that various certificates including copying of resident certificate can acquire with multi-copier installed in convenience stores of the whole country. Only one made Seal Registration in Yokohama-shi can acquire Seal Registration Certificate. Only person with permanent domicile can acquire copying of tag of family register and family register (all, personal matter) certificate in Yokohama-shi. (※) By residence in Yokohama-shi, one with permanent domicile, please refer to municipality with permanent domicile for copying of tag of family register certificate, family register in the suburbs. ※From 9:00 a.m. as for copying of tag of family register certificate and family register on weekdays to 5:00 p.m. It is available from early morning to the middle of the night. It is available in holiday and the night when ward offices are not open. The use time: From 6:30 a.m. to 11:00 p.m.
Fee becomes cheaper than window. Fee becomes cheaper 50 yen than we acquire at windows such as ward offices. As well as the city, it is available at about 54,000 stores of the whole country. 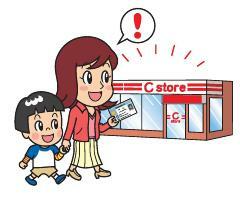 ※There are other available stores in the whole country. The details, please identify "store information (the outside site) that convenience store grant is available" to. We use multi-copier installed in convenience store. From application to grant, the person operates multi-copier. By simple operation by touch panel while we look at guidance screen, entry of application is unnecessary, too. ※ Detailed operation method of multi-copier, please identify "the acquisition method (the outside site) of certificate". 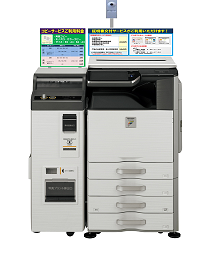 Multi-copier of convenience store is copier which print of copy and photograph can play. By various security measures, we keep personal information. As information is removed automatically, personal information does not remain to multi-copier. We prevent collecting lapse of memory of my number card and certificate by sound guidance. By exclusive network, coding of communication, we follow information from unauthorized access. Preventive measures against various forgery, manipulation are taken on certificate which we acquired. ※ The details of preventive measures against forgery, manipulation, please identify page (the outside site) of local public entity information system mechanism. It is only the person having my number card that is available. We cannot take advantage of the day when we received my number card. As the use is enabled from the next day when we received, please be careful. When family register reports such as birth or marriage registration form are submitted, we need a fixed period of time before we reflect on family register certificate. Please be careful. Please contact ward office for the details. Concerning system, we may not issue (cases that person planning transference is included in in case and household of certificate which handwriting postscript needs). Please contact ward office for the details. Password when we use is password (four columns) of electronic certificate for user proof. Please be careful when you get a wrong password consecutively three times as you are not available. Refund, exchange of acquired certificate is not possible. As it takes some time until certificate is printed, we hope that we do not leave the place to receipt of certificate. The handling of certificate corresponding to rule of fee exemption is not possible. Ward officeService counter in the city hallPlease use this. About social security, tax number system (my number system)Social security, tax number system (my number system)Please confirm ".